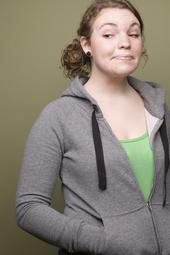 Why Beth Stelling Is Awesome! Usually Essay Fiesta introduces the month’s readers to you in a forum we call “Get To Know.” But since all our readers for our special anniversary show have read before, we thought we’d change things up a bit with a series we like to call “Why So-And-So Is Awesome!” First up, Beth Stelling. 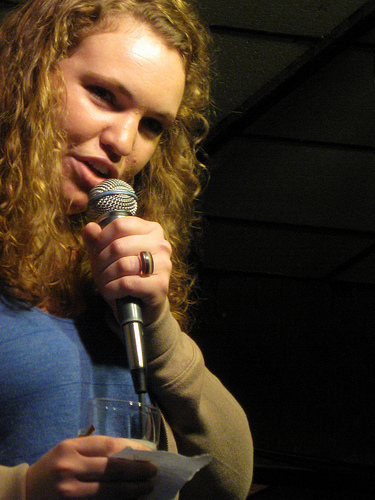 The Chicago Reader picked Beth Stelling as their stand-up of the year this year. If that’s not awesome enough, how about this: She’s also a really, really nice person. Beth co-hosts Entertaining Julia at Town Hall Pub with the Puterbaugh Sisters and does stand-up all around Chicago. She’s also quite the actress, having appeared recently in Collaboraction’s Sketchbook X. Come out to see Beth and her unique brand of humor on Nov. 15 at the Book Cellar. And remember, as always, we’re benefiting the Howard Brown Health Center. « Essay Fiesta on Literary Chicago and Fun Facts!